Rina Jooste’s Jammer As Ek So Bitter Is won the South African Film and Television Awards (SAFTA) for: Best Director of a Documentary and Best Overall Documentary in 2011. Jammer As Ek So Bitter Is explores the silent violence of peer pressure and how it manifests in the lives of four teenage girls. The girls tell their stories openly which shows that the team won their trust to elicit such frank retelling of their stories. The stories are both fascinating and disturbing which makes it difficult to watch at times. HOW DID YOU FIND THIS STORY? My partner Nadiva Schraibman approached me with the concept of doing a documentary series on the violence in our schools. She was editing a research paper for the Justice and Crime Prevention NGO and decided it needed to be presented through television or film in order to reach the public since research papers gather dust. Since the subject matter of violence in our country is close to my heart and I am constantly doing research about it, we wrote a proposal for a four-part series. Incidentally, shortly after we wrote the proposal, the SABC put out a brief for a documentary series focusing on Human Rights, it was open for suggestions. I decided to submit the proposal under the heading of Youth and Human Rights. SABC commissioned two of the four proposed episodes, one on bullying in primary township schools and one on peer pressure and its manifestations amongst teenage girls in white suburbia. I usually have my characters lined up when I propose or plan a documentary film. In this instance I did not have characters, only the concept. It was extremely hard to find teenage girls whose parents were prepared to let them speak on camera about very personal and hard hitting experiences. I tried various avenues without success. My bedroom is always littered with books, magazines and newspapers and out of desperation I started reading a leisure magazine one night to try and switch off before going to bed, I opened the magazine at an article about the very subject of the documentary – the peer pressure on teenage girls and the manifestations thereof. The next morning I located the author of the article, Heidi Chester, who was a drama teacher at the time and had dedicated her drama studio to the plight of teenagers who needed help. We were both so excited when we realised that we were working on exactly the same subject. She was wonderful – very cooperative and facilitated the filming of the teenagers. Through her I met with possible characters and started spending time with them, did the club circuit over weekends and hung out in malls. Heidi arranged the legal and administrative arrangements with the parents and this is how we located the characters, which was the most challenging part of making this documentary. Heidi herself became a character through the role of facilitating the process and feeding us with lots of content. The documentary would not have been possible without her help. WHY DID YOU MAKE THIS FILM AND WHO IS YOUR TARGET AUDIENCE? Predominantly parents, educators and the youth from age 13 and older. We live in a very violent society and this has become the norm. However, I don’t think it is normal – I grew up in a protected environment during the 1970’s and 1980’s in white suburbia, where I was blissfully unaware of the other side. My childhood years were wonderful, protected and free of violence, but it was false and fabricated to suit apartheid policies. Today we live with the legacy and damages of apartheid, which will take generations to heal. There is also damage in white society, despite us having been the fortunate few previously, and I wanted to address one of the many challenges faced in white middle class society today, not as a legacy of apartheid, but as a microcosm of what is happening in our South African society at large – moral decay and more for various reasons that are briefly mentioned or touched on in the film. Parents and educators are often in denial and by making this hard hitting documentary, I wanted to highlight these shocking events taking place around us in our schools and society at large. I hope that the documentary is an eye-opener for parents and for teenagers. It should be a reminder and create awareness of what is going on around them and hopefully encourage them to seek help if they identify with the characters. It wasn’t accepted at any of the many film festivals it was submitted to. Heidi Chester uses it at workshops that she presents to the youth, and I am looking for an organisation or support system that will present it to schools and youth organisations so it reaches a wider audience. WHAT SABC STRAND WAS THIS COMMISSIONED FOR AND WHEN WAS IT BROADCAST? SABC 1 put out a brief in 2008 for a documentary series on Human Rights. We produced the documentary in 2009 and it was broadcast in March 2010 on SABC 1 in the doccie slot and again in April 2010 on SABC 3’s Special Assignment. WHAT WAS THE COST PER MINUTE (CPM) FOR THE FILM? WHAT CHALLENGES WERE THERE WITHIN THE BUDGET? We work within our budget and I make sure that we stay within and make it work for us to the best of our abilities. We negotiate fees with our crew and have loyal and supportive crew that we work with. WHEN YOU SET OUT TO MAKE A FILM, DO YOU HAVE A STRONG POSITION ON THE TOPIC? Yes I have very strong opinions and feelings about the topics and subjects of my films, including future films in planning. I need this opinion in order to portray a message of substance, and it’s this passion for what I do and believe in that drives me. However, I always aim to remain neutral and not judge the characters and subject matter. I also want to look at various viewpoints and then decide how to present mine. So sometimes a film could be open-ended, but I always try to leave my films open to dialogue and debate. DID YOU HAVE A POSITION ON THIS FILM? My position on this film was the fact that I constantly think about and question the violence in our country – on all levels of our society, from high income to low income citizens. It has spread throughout in different forms and through different platforms and in different manifestations. I knew about the challenges faced by white youth specifically, but needed to do much more thorough research in order to get my head around it – which I then did. I took a position and knew what message I wanted to portray in the film, which I believe I succeeded in with the help of my brilliant editor CA van Aswegen, and the rest of the team. The message I wanted to convey was making people aware of the peer pressure faced by teenagers in South African society today and warn them of the related manifestations. And to illustrate that the challenges faced by youth could be found in all social strata across the racial divide, it is not exclusive to any group. WHO DID YOUR CAMERA WORK? WHY DID YOU CHOOSE HER? Natalie Haarhoff. 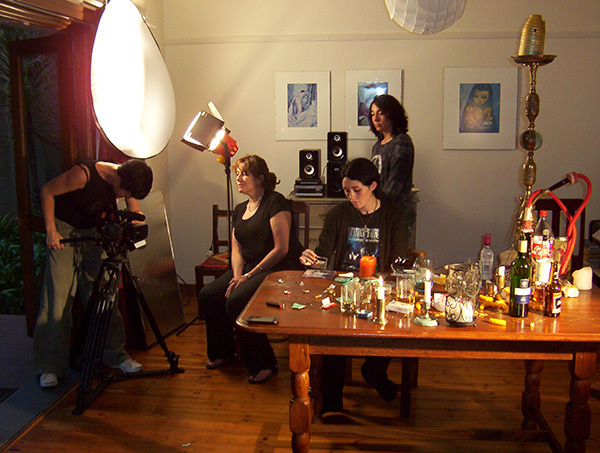 We decided to use a female cinematographer since our characters were all female. We never worked with Natalie prior to Jammer As Ek Bitter Is, but we knew her work and how brilliant she is and how she has the ability to capture strong messages through her choice of visuals. We needed someone with a sensitive nature and without an inflated ego as we believe there is no room for this when one works with real people with real problems. We found this in Natalie. It was an excellent choice since she did not only do great detailed filming, but was also sensitive towards the subject matter and non-intrusive behind the camera. We filmed very damaged, traumatised teens and they were comfortable with me, but bringing in a camera person and sound person can influence the flow of interviews and filming. Both Natalie and sound technician, President Kapa, understood this and with their sensitive and non-intrusive attitudes, I believe we succeeded. In making films of this nature, the supporting crew such as camera and sound also have a big role to play by understanding the sensitive nature and being aware of this whilst working with the characters. It is also my responsibility as the director to protect my characters and I have an ethical responsibility in this regard that I take very seriously. YOUR IMAGES LOOK VERY DETAILED AND RICH – WHAT CAMERA DID YOU USE? Sony V1. The characters also took personal handycams with them to parties and events and we integrated this footage into the film. We borrowed feature film footage from Bakgat 1. CA’s company produced the film, so it came in very handy. We had limitations on filming at schools – we did get entry into a school, but our visuals were not that great. HOW DID YOU CHOOSE THE TEAM YOU WORKED WITH AND THAT SUPPORTED YOU THROUGH THIS? My partner Nadiva Schraibman approached me with the concept as explained before, and she took the role of producer. 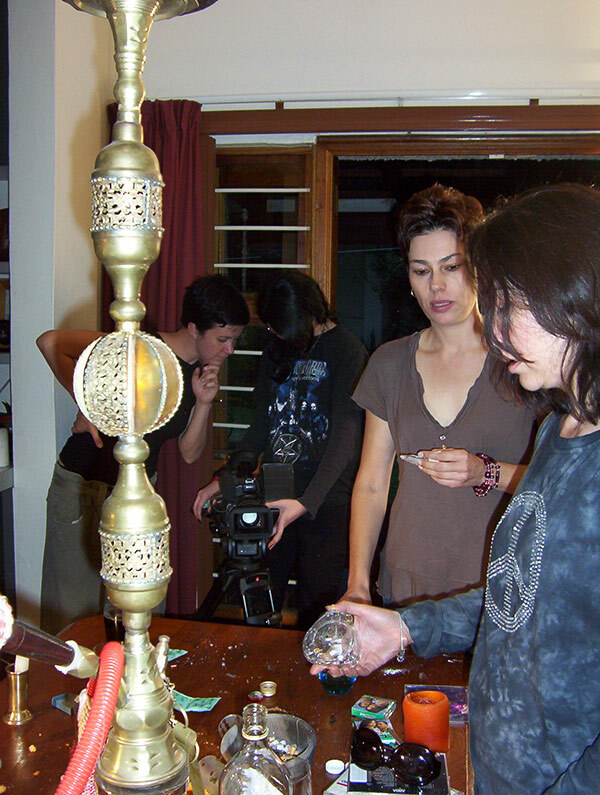 Nadiva decided to use cinematographer Natalie Haarhoff for both the episodes. We had never worked with her before and hoped that she would be available and willing to work for the SABC rate that was low by her standards – and she agreed. It was a wonderful experience for all involved and the start of a new professional partnership with Natalie. Nadiva always works with sound technician President Kapa and fortunately he was available for both episodes which ensured quality and consistent sound levels. Janno Muller from Onkeysound was also Nadiva’s choice for the audio final mix – again for both episodes, which was an excellent choice. Since then we always make use of his services. Fortunately for me, my editor CA van Aswegen, whom I grew up with as a documentary filmmaker, was available. We understand each other so it was a great experience to work with him again. We all know how much the editing of a documentary film contributes to the final product, and he understands my messages and knows how to help me get there. WHY DID YOU INTERVIEW ARYNA’S MOTHER IN HER BEDROOM? IT FEELS TOO INTIMATE FOR ME – WHAT WERE YOU HOPING TO ACHIEVE WITH THIS PLACING, OR WHY DID YOU PLACE HER HERE? It was an intentional choice to interview her in her bedroom. It is an intimate film since the characters opened up so much and revealed so much of themselves, it was part of a stylistic choice. THIS IS BOTH A DEPRESSING AND A COMPELLING FILM. HOW DO YOU COPE WITH SUCH INTENSELY NEGATIVE SUBJECT MATTER? DO YOU GO FOR THERAPY, OR ANY KIND OF DEBRIEFING? Very relevant question. Yes most of the films I work on are depressing subject matter and I deal a lot with traumatised and damaged people. I make a point of being aware of this situation at all times and try to take time out to gain perspective. I have a brilliant homeopath who knows what remedies I need to help me cope – her role is that of therapist. My sister, also a homeopath, offers similar support. I have a very supportive group of friends and family, and the special man in my life also offers a great deal of support and understanding. I exercise by walking my dogs and doing yoga which helps with stress release. I follow a very healthy eating plan and overall healthy lifestyle, I love nature and find that the combination helps me to cope. And then most importantly, I love nothing more than making documentary films – I am always on a mission with a story that needs to be told and documentary film gives me this outlet, so the passion and love for what I do makes it all worthwhile. HOW MANY HOURS OF FOOTAGE DID YOU HAVE? WAS THERE ANYTHING YOU COULDN’T FIT INTO THE FINAL CUT THAT YOU WOULD REALLY HAVE LIKED PEOPLE TO SEE? We filmed in a very structured and focused manner and had about 12 hours of footage for a 48-minute cut. We filmed over eight days. It wasn’t a kill-your-darlings edit really, we managed to use most of the footage that we planned to use and it was relatively easy. WHAT WAS YOUR ROLE AS THE DIRECTOR? DO YOU FIND THAT ON DIFFERENT PROJECTS THE DIRECTOR NEEDS TO DO DIFFERENT THINGS? AND WHAT WAS REQUIRED OF YOU, BY THE CHARACTERS PERHAPS, IN THIS FILM? I prefer to do as much research on the subject matter myself, in this way you can really familiarise yourself with the topic and thorough research to me is key to a good film – it shows in the content. I did most of the research myself as well as identifying and choosing the characters, which was the most challenging part of the film. I then spent as much time as we had available with the characters – getting to know them as well as them becoming comfortable with me, which allows for better interviews and getting quality content and opinions from the characters. After very thorough research and spending lots of time with the characters I then planned the filming. It never works out exactly as planned, since we work with real people and real life situations. I often have to plan my shooting schedule around characters’ availability or around events and activities to film, as well as budget allowance for shoot days. I prefer to do this myself since I know what I need from whom and when. I also prefer to communicate with my characters myself since we form close relationships, and I need them to trust me. I then plan my shot list according to my schedule as well as the interview questions that forms a large part of the filming. This takes a lot of time since it informs most of the content of the film and ensures that I am well informed during the interview. Once I have the shooting schedule, shot list and interview questions ready, I have a meeting with the producer and cinematographer to finalise the shooting style and detail. Since I am not a cinematographer, I rely on expert advice from the cinematographer, hence the importance of using someone reliable and whom I can relate to and vice versa. The relationship the director has with the crew is very important, but the ones you have with the cinematographer and editor are very important and shouldn’t be underestimated – they make a huge difference to the final product. I try not to interfere with the cinematographer. If I trust them, I leave them to do their work. I ensure that they are properly briefed and do check rushes and double-check that all we need has been captured. In this way, we empower each other and I find I get what I need and ask for. I don’t work with a script, firstly because I don’t know how to write a documentary script and secondly because I believe a documentary where I follow characters and tell their stories is a work in progress. I follow my shot list and do thorough interviews, but often things come up and we add a shoot day to cover for unexpected events or happenings around the film. I am very flexible in this regard as long as it can contribute towards the film and I remain within budget. I work in a very organised and structured manner – my filming is planned very thoroughly and I know exactly what I want, but I am always open to suggestions and advice from the team. I am also present for most of the editing of the film. I have long discussions with my editor to make sure he understands where the story needs to go and what message I want to convey. I also collaborate with him before we start filming to ensure I follow the style we choose and stick to it. I often communicate with the editor during the filming period to ensure we are on the right track and bounce ideas around, ensuring a quality product. After edit I also do the briefing for audio final mix as well and the approval thereof. All in all I am very hands on with directing my films, from inception, idea, proposal, pitch, research, filming, editing right through to final mix and delivery. In the case of Jammer As Ek Bitter Is it was also a hands-on experience from start to finish. WHAT DO YOU THINK A FILM CAN DO FOR THE PEOPLE IN IT? Often films of this nature are a cathartic process for the characters, giving them the opportunity and environment in which they can open up and talk about their experiences or issues. It sometimes brings them closer to healing or accepting. I have had various experiences with characters, but mostly of a positive nature. In this instance it did bring healing to Aryna and Naquiska. Aryna commented afterwards that the chance to open up and talk about her experiences helped her deal with them and gave her the final push to move on. She was also happy that she could share her experience so that others could be helped through the story being told. Naquiska also commented that the process has helped her – today she is a medical student at Wits and doing very well. She still wears her black clothes and body piercings but does not stand out so much in her new environment. I still have contact with both of them as well as Aryna’s mom and Heidi Chester. The girl whose identity we had to protect sadly disappeared and chose not to make contact with me again. Making these kind of documentary films, a director has a huge responsibility towards their characters and cannot walk away from them once the film is finished. I make sure I communicate broadcast dates as well as film festival dates with characters and any big announcement around the film, which in this instance would include winning two SAFTA awards for it.